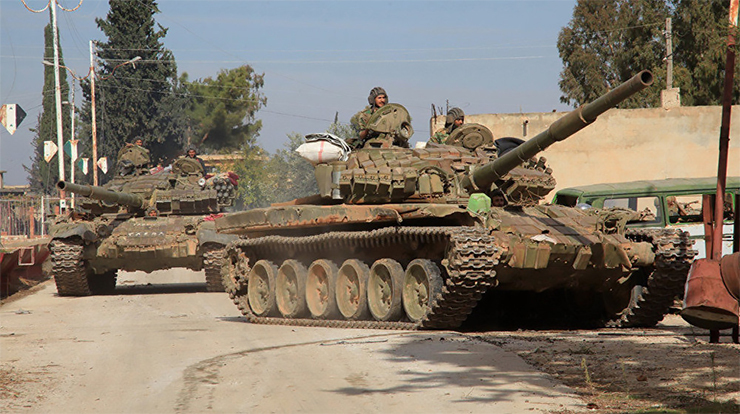 The Syrian forces continue their offensive in southwestern Syria, in the Daraa Governorate. At first the attack was somewhat spontaneous in nature, since the pro-Iranian units began armed hostilities without receiving consent from the Russian troops first. Up until 23 June, the Russian Aerospace Forces (VKS) had not taken part in the offensive, which explains the Syrian public appeal for help, as its troops failed to advance in any direction in the first 24 hours. In the meantime, on 24 June a statement was published about the withdrawal of some Russian fighter jets and helicopters from Syria. The second question is directly connected to the first. What will Moscow’s next order be when it comes to supporting Assad’s military offensive forces? Thus far, all the previous successful military offensives led by the Syrian Army had had the desired outcome only after receiving support from the Russian Aviation. In addition, unlike prior offensives during which militants had been completely surrounded, the situation in Daraa is completely different, as the militants there receive support as well as supplies from a neighboring region, i.e. Jordan. So far, over the course of the entire Syrian conflict, the Syrian Army has not been able to capture a single kilometer of its northern border in two and a half years. The situation in Daraa is further exacerbated by the fact that on the advancing troops’ eastern flank of the there is a de-escalation zone, al-Tanf, where a large opposition force is concentrated in addition to the American coalition troops. There have been at least two recorded instances when the US attacked military sites located deep inside the Syrian territories from this zone using HIMARS rocket systems. And such a possibility cannot be precluded at present. while American are playing a double game. On 22 June, “unidentified” fighter jets attacked a convoy of Shiite pro-Assad forces once again, not far from the de-escalation zone, al-Tanf. Clearly, the coalition is responsible for the strike and not Israel, as earlier the Shiite units received a warning from the coalition stating that movement of any armed forces was not permitted within a 30-kilometer radius around the de-escalation zone. Hence the fruitless nature of the Syrian Army offensive in the first four days of its operations prompted the Russian military commanders to help them. The Russian Reconciliation Center for Syria announced that, on 23 June, the Syrian Arab Army (SAA) and the Free Syrian Army (TFSA) units, with the support of the Russian Aviation, managed to ward off the attack by the banned terrorist group Jabhat al-Nusra in the northwestern part of the Southern de-escalation zone. On the night of 24 June, more than a thousand militants attacked the Syrian 9th Armored Division in the region of Damm and Dayr-Damm. The Syrian military personnel began defensive battles, so far their losses amount to 5 dead and 19 injured. The residents of these populated areas also came under attack by the terrorists. The statement released by the Center reported that local commanders of the Free Syrian Army units asked for aid in the counter-attack and had earlier agreed to side with the legitimate Syrian regime. They contacted the Syrian forces via the Russian Reconciliation Center for Syria. The negotiations ended with the leader of the military unit, Wajdi Abu Sles, announcing that the populated areas of Dayr-Damm, Ash-Shia and Jaddal under their control would be voluntarily handed over to the legitimate Syrian government and that the TFSA troops would join the Syrian army in the fight against the banned terrorist groups Jabhat al-Nusra and DAESH. According to the Reconciliation Center, the Russian Aviation lent support to these forces. The Russian military reported that the militants lost 70 lives during this counter-attack. In addition, three armored cars and 14 vehicles equipped with heavy machine guns were destroyed. Russian forces noted that residents from 12 populated areas have joined the Syrian government forces. In several areas, the Syrian Army together with the units from the Free Syrian Army has managed to stop their opponents. Measures are being taken to protect the civilian population. Considering the latest developments, the Iranian proxy forces are behaving somewhat strangely, there have been reports that helicopters of the Islamic Revolutionary Guard Corps are being actively used to bombard residential districts with civilians using barrel bombs and there has been news about Syrian military personnel being killed by firing squads for refusing to advance to the frontline without aviation and artillery support. In large part, Hezbollah groups, used in a somewhat defensive capacity in the Darra operation, have been responsible for these deaths. Syrian sources have been forced to write about the heavy losses of its more capable offensive military units dubbed the Tigers, which are conducting the most thought through operations. The Tigers have been establishing mobile units and boot camps that gather those who would fight for money. The Tigers are financially supported by two Syrian oligarchs, the President’s brother-in-law Makhlouf and his partner and businessman, Talal Dakkak, as well as war spoils and trophies. In present day Syria with its ruined economy, becoming a mercenary has become the means of survival in this drawn out war. The US coalition and Israel are, for now, waiting for Russia to convince the Iranians to leave the border zone in southwestern Syria, and if this does not happen, the strikes by “unidentified” fighter jets will occur even more frequently. Besides, the militants have received substantial caches of weapons from the US de-escalation zone, including second generation Stingers, which could destroy targets at the height of more than 8 kilometers. Possibly, that is the reason why the Russian Aviation has not taken on a more active role in the ongoing operations. Overall, the Syrian war continues in its most drawn out state.